Use of the internet for politics did not give particular advantage to either party. Still, online political activists favored Democratic candidates. Republican and Democratic voters were equally likely to say that the internet was their main source of election news (17% among each group). In contrast, there were notable differences between Republican and Democratic voters in their preferences for other news sources. 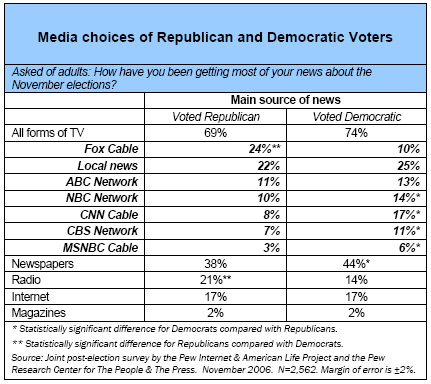 For instance, Democratic voters were more likely to cite newspapers and certain broadcast and cable news operations as their main sources of news, while Republican voters favored the Fox cable TV News and radio. Put differently, the internet news audience for the 2006 race was no different in its vote preferences than the public as a whole. Among all voters, 45% voted Democratic and 35% voted Republican; among those who relied upon the internet for election news, 43% voted Democratic and 35% voted Republican. Among all internet users: 44% voted for Democratic congressional candidates and 36% voted for Republicans, Non-internet users, who tend to be older and poorer, were considerably more likely than the internet users to vote Democratic. And among campaign internet users (those who used the internet to get political news and information related to the 2006 race) the same bipartisan phenomenon holds: 41% of campaign internet users voted for Republican candidates for Congress and 36% of campaign internet users voted for Democrats. The one meaningful distinction emerged among online political activists. They had a statistically meaningful preference for Democratic candidates: 52% of those activists voted for the Democratic candidates, while 35% voted for Republicans. This might stem from the more liberal intensity of political content creators and sharers, though liberals are not the dominant ideological group among political content creators. Liberal Democrats were particularly drawn to some online political activities. Liberal Democrats are sometimes the most interested in online political news and information and who are the most active in pursing political activities on the internet. The number of cases in the sample of campaign internet users is too small for much analysis. For instance, there were 82 people in the campaign internet user group who said they were moderate or liberal Republicans and 102 who said they were liberal Democrats. Still, there were some clear differences that applied to liberal Democrats. Among ideological groups, liberal Democrats were the most likely to be online political activists, to get political material from blogs, international news organizations, email listservs and humor or satire sites. Liberal Democrats were also the most likely to say they sought out political websites that agreed with their point of view. And they were the least likely group to say that they used political websites that disagreed with their point of view.